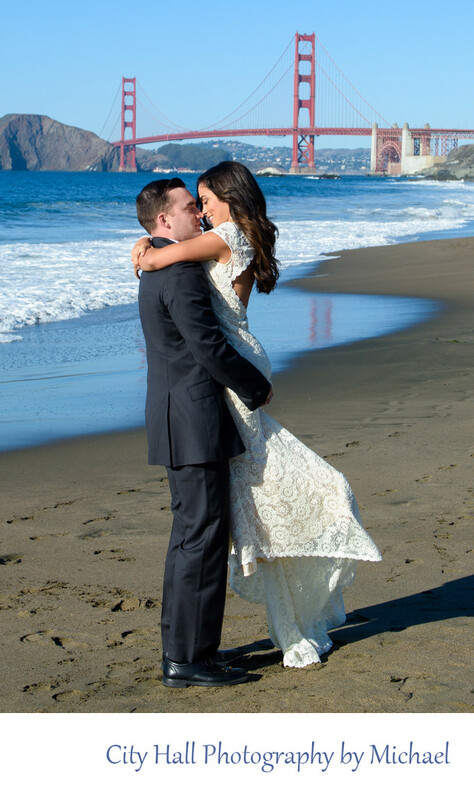 Baker Beach is one of our more popular stops on our San Francisco wedding photography tour. Especially on nice days, it is great to take our married couples to the beach and get some fun images. During the week in the off-season, you can often get photos like the one above with very few people in the background. The water was particularly blue on this day (no Photoshop) so we wanted to get the couple as close to the ocean waves as we could while still remaining safety. Baker Beach provides the best view of the bridge in the late afternoon, especially on a clear day. This is because setting sun shines directly on the Golden Gate Bridge which brings out the color and texture.